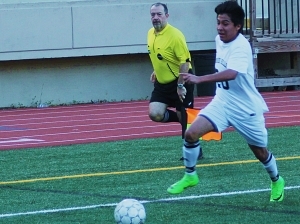 Sophomore Izaak Clarke had a hattrick in the first half including the opening goal of the game. It would take Clarke less than 18 minutes of play to get his three goals. Clarke would come back with his second goal and Lloyd would match him to make it 4-0 with 28 minutes to play in the half. The final piece of the hattrick came for Clarke with 22:51 left in the first half as he hit a long blast in the middle of the field to make it 5-0 at the half. Less than two minutes into the second half Senai Gezai took advantage of the crowd in front of the goal to make it 6-0. Gezai would get his second goal just four minutes later to make it 7-0. Cantrice Hart made it 8-0 with a penalty kick and then 9-0 as he deflects a pass in front of the goal into the net. Alan Alverado finished the game as he made the 10th goal with 11:50 to play to end the game. Druid Hills (10-8-1) plays host to Perry (12-4-1), the Region 2 No. 2 seed, on Wednesday at 7:00 pm on the turf at Adams Stadium. Perry defeated Hardaway 3-0 to advance to the Sweet 16 against Druid Hills. Stone Mountain and Towers had their seasons come to an end with first round losses in Class 3A state playoff actions. Stone Mountain lost a heartbreaker 3-2 to Calhoun while Towers (10-5-0) fell 10-0 to North Murray (14-1-2). North Murray knocked Towers out of the playoffs with a 10- victory.